Green Day Pedometer is an app for iPhone 5S, iPhone 6, iPhone 6 Plus, iPhone 6S, iPhone 6S Plus, iPhone 7, iPhone 7 Plus, and iPod Touch (6th gen) designed to make it easier to reach a daily goal of 10,000 steps. You can also see your progress on your Apple Watch if you have one. When your progress indicator is red, you're under halfway there. Once it turns yellow, you're on the home stretch. It turns green when you reach your goal. 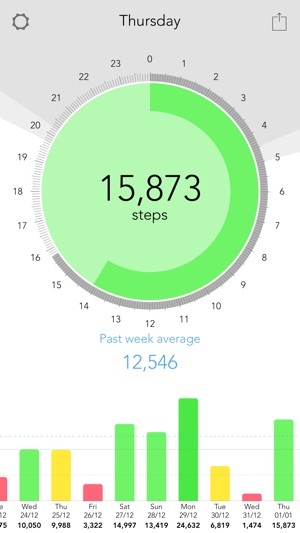 Use the history view to keep your average step count above your goal. As long as the blue line is above the goal you're doing great. You can let Green Day Pedometer have access to your step history from the Health App. Watch out for red days. They really hurt your average. Green Day Pedometer displays time using a 24 hour clock so you can easily see how much time there is left in the day. By using your location, it shows you accurate sunrise and sunset times so you can make best use of the daylight hours all year round. No personal information is sent from Green Day Pedometer without your consent. Your location is not tracked or logged by Green Day Pedometer. We do NOT send your location anywhere. Tak naprawdę nie wiem jak go uruchomić, na wykresie słupki z data wrześniowa mimo to, ze mamy październik . Krokomierz nie działa chyba sam potrzebuje kompanów typu zegarek bądź opaska ??? W każdym razie nie działa .